It’s not the goal, it’s more of a by-product of achieving a goal. Kind of like when Toyota was pronounced the #1 car manufacturer in the world, the CEO was quoting as saying it wasn’t the goal but a by-product of their focus on innovation etc. Think about this when you see someone is seemingly against you – are they really? The first time you do something it’s hard. The second and third time it gets easier. The problem is as you repeat something the effectiveness wears off. The first time someone does something remarkable everyone talks about it, the second time a little bit and the third time so so. Really it is a race to be first. The cool thing is that anybody can be first at something. And that is remarkable. 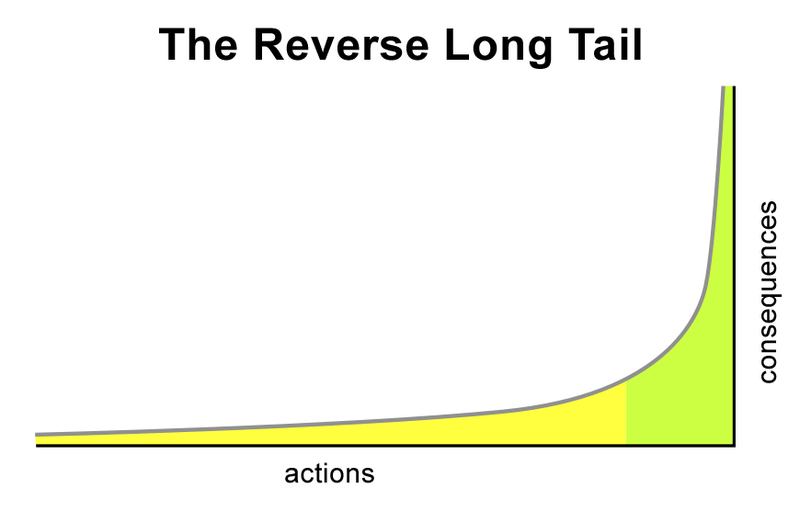 When you are doing something new, unprecedented or remarkable you encounter the reverse long tail. 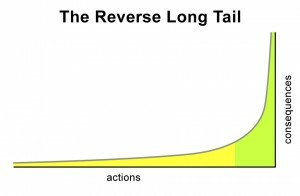 Each of your actions have what seem to be small consequences, however over the long run things begin to snowball and consequences increase. Hence why…. perseverance is genius. Patience is a virtue. Even better Patience & Consistency are a killer duo. If you are patient in achieving your goals paired with consistency in execution you are sure to reach the pinacle. You see anyone can do anything now (and they do) if you want to dominate your field of interest, be patient and consistent. Keep turning up time after time. For consistency creates momentum, reliability, reinforcement. It creates results. If these aren’t something you are good at – start working on it. Now. You can get going in the wrong gear – but it's bloody hard! I remember fondly my first motorbike experience – a family friend put it in gear for me and told me how to release the clutch and turn the accelerator. I immediately raced off and bailed in a ditch. No problem got on again and off I went. From then though it was up to me. I knew what to do – I just had to do it. But you know what? I tried for weeks and weeks and weeks to get the knack of it, I couldn’t for the sake of me take off, I would always stall. It frustrated me that I couldn’t get it right. Finally I got the knack of it and managed to coerce it into action – after what must have been hundreds of attempts. A few months later, I found the problem, guess what it was? I was in the wrong gear, 1 up from neutral was 2nd gear, not first. First was 1 down. That’ s why it would always die on me. I was in the WRONG gear! Lesson learnt – you can get going in the wrong gear – but it’s bloody hard. For whatever goal you are seeking, have you checked the gear you are in? If you just swap gears, you can probably get there much much faster (and not make it so hard on yourself). If you’re not sure what gear you should be in, ask those that have fulfilled the goal already, often they can get you into the right gear within seconds. Just before you reach your goal, there is a state of chaos, where lots of things are on the go, you’re never sure if you will make it, but you keep pushing through, incredibly you do. Return back to normal. Wake up two weeks later again to find yourself doing it again. Face it, it’s reality. If your in the muck now, keep at it, all those baby steps add up.